For Windows, you may need to double the % to %%,. I am not a windows user so I may be wrong about this. 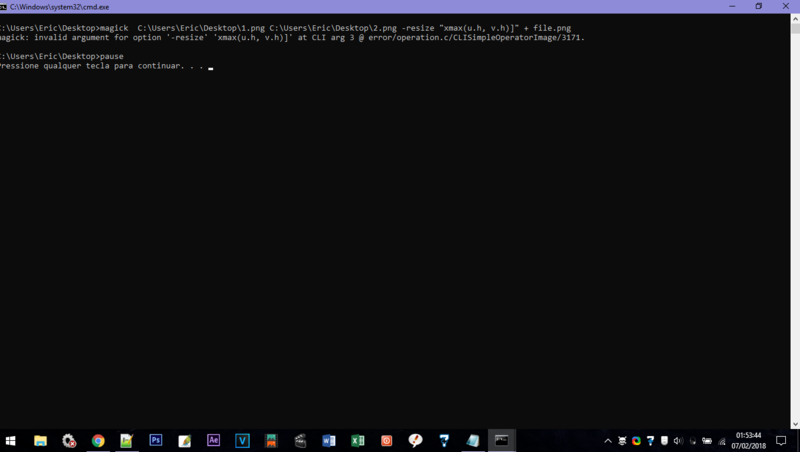 For IM 6, you must calculate the the resize argument separately first and store in a variable. Sorry I do not know the equivalent for Windows syntax. I'm using version 7.0. What should I do with this comandy exactly? 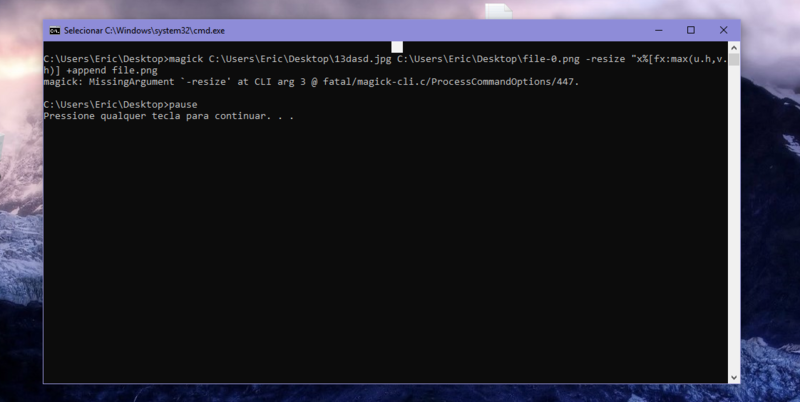 "magick image1 image2 -resize "x%%[fx:max(u.h, v.h)]" +append result"
Your error message appears then vanishes. Put a "pause" in your script, then copy-paste the error message here. 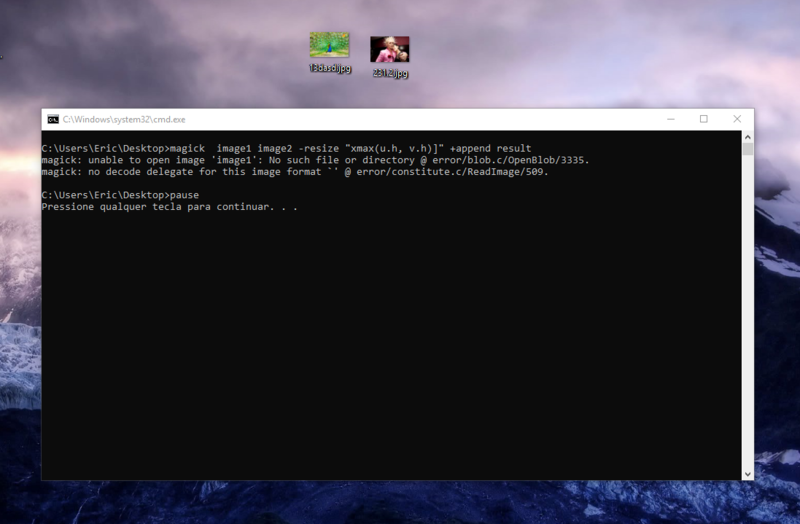 Where Fred put "image1" and "image2", it needs the filenames of your images. As you are using a BAT file, you can put "%1" and "%2" (with no quotes). Also, for "result" put an output filename, like "out.png". Sorry, I should have made it more clear about the filenames for image1 and image2 and result. It's seems that it's a problem with the resize specifications, probably something that I didn't specified. I do not know window bat scripting but there is something about doubling % to %%. But I am not sure which ones need doubling. The ones for %1 and %2 or the one for "x%[fx:max(u.h, v.h)]" or neither. But remove the + sign. ImageMagick syntax does not use that. See https://www.imagemagick.org/Usage/windows/ for syntax differences. In the BAT file, %1 and %2, the "%" symbols have special meanings to the shell interpreter, so they are fine. But we don't want the special meaning for the "%" in "x%%[fx:max(u.h,v.h)]", so double that one. For "+", you should have "+append". Good catch. I completely missed that. Ok, we are getting closer. The problem seems be with that "-resize "x%%[fx:max(u.h,v.h)]" part, I tried without it, and it worked like a charm, but it didn't resized the image, of course. It didn't work, this error appeared, saying "Missing Argument"